($149 +tax is for 7 night stays). 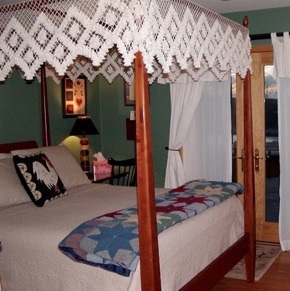 4 poster canopy queen bed, lake view, comfortable sitting chair, writing table, and dresser. French doors to the deck and deck chairs. The private bath with shower, tub and hair dryer is located directly across from your room. Located on the first floor, A/C. A guest microwave and refrigerator are available. 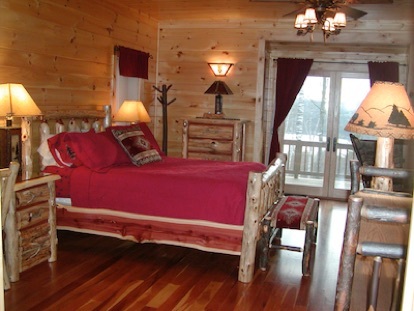 Queen sleigh bed, seasonal fireplace, ensuite bath with jacuzzi tub and separate shower, lake view and french doors to the deck, writing desk and sitting chair, and A/C. Located on the first floor. Click on Photo to see more pictures and information. 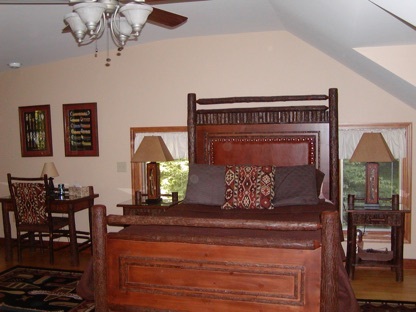 Spacious room, seasonal fireplace, lake view and private deck, ensuite bathroom with shower, table and chairs, writing desk, 2 reading chairs, and A/C. Located on the second floor. Click on Photo to see more pictures and more information. 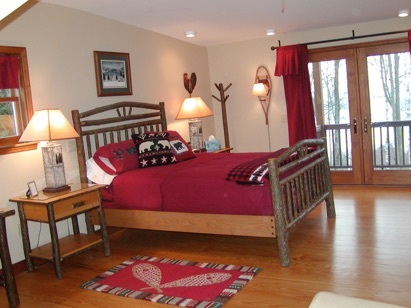 Spacious room, seasonal fireplace, lake view with large private deck, ensuite bathroom with 2 person soaking tub and glass custom shower, A/C, table and chairs, 2 reading chairs. Located on the second floor. Click on Photo to see more pictures and for more information. Newly room located on 1st floor with private entrance. 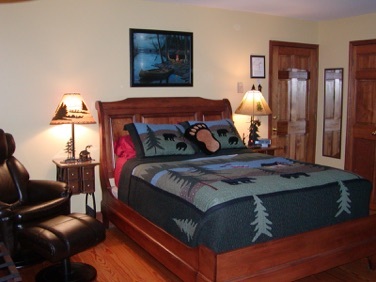 Spacious room with exquisite lodge furnishings- queen bed, table and chairs, 2 reading chairs, seasonal fireplace, lake view, private deck, ensuite bathroom with jacuzzi tub and separate glass shower, microwave and refrigerator.